It’s a feature of Celtic Connections that creative producer Donald Shaw is always receptive to new ideas. Hence Thursday evening’s mainstage slot being given to the live premiere of a videogame soundtrack, a first for the festival but musically well within its scope. The story behind The Bard’s Tale lV Barrows Deep, to give the game its full name, bears repeating. When leading videogame development studio InXile Entertainment’s CEO, Brian Fargo decided to create a new version of the highly successful Bard’s Tale to mark its thirtieth anniversary, this time incorporating Scottish traditional music and Gaelic song, he approached Dundee-based musician Ged Grimes. Grimes, the bassist with pop trio Danny Wilson and currently with Simple Minds, is an experienced soundtrack composer. He knew nothing, however, about Gaeiic song and traditional music. But to paraphrase the old TV commercial, he knew someone who does. Eilidh Mackenzie grew up in the Gaelic tradition on Lewis and was able to guide Grimes towards what he needed. The game, set in 18th century Scotland and which was shown on a large screen, is pure fantasy, of course. The songs, though, are real indeed and were performed here by real-deal singers, including Mackenzie and her sisters, Fiona and Gillie, and the wonderfully smoky-toned Kathleen MacInnes, supported by musicians from the traditional music scene who created the ethereal and dramatic sounds a fantasy soundtrack requires but who could also bring a keen creative edge and empathy to arrangements of traditional songs. Further authenticity was provided by Scots singer Fiona Hunter, bringing honest relish to the specially written A Hardworking Hand, and young Gaelic singers Kim Carnie and Eilidh Cormack, the latter’s singing of the waulking song Cha D’ Fhuair M’in Cadal to Mairi Chaimbeul’s beautifully paced harp accompaniment being particularly impressive. If Barrows Deep repeats its forerunner’s success, then as well as providing a memorable anthem in Across the Seven Realms, Grimes will likely have introduced a whole new audience to Gaelic music’s power and immense charm. The latest annual showcase CD from the National Centre of Excellence in Traditional Music at Plockton High School, Hooked! is testament to how well the students, ranging from secondary years 3 to 6, learn from both resident tutors and passing musicians who call in to give workshops. There’s a guitar trio treatment of the wonderful old fiddle tune Roslin Castle that not only serves as a fine tribute to the school’s long serving guitar tutor, Jack Evans, it also carries the spirit of Evans’ old folk-swing band, the legendary Easy Club. It’s also notable that a large percentage of the tunes performed over these two discs were written by the students themselves and stand up well alongside familiar items by established composers including Gordon Duncan, Allan MacDonald and Hamish Moore. A couple of tracks feature all sixteen students on the course in one large ensemble but the majority of them feature smaller line-ups, including particularly strong duos and trios, delivering imaginatively arranged songs in both Gaelic and Scots and uptempo dance tunes and slow airs alike with the sort of skill and heart that show that traditional music’s future is in good hands. It’s just possible that there have been more people on Glasgow Royal Concert Hall’s stage at some point during the venue’s near-thirty years history than there were at the finale of this, the opening concert of Celtic Connections’ 26th iteration. Less likely, though, would have been the presence at any time of more tambourines put to such confident musical use. The tambourine is almost the national instrument in Galicia – it’s overtaken by the Galician bagpipe, the gaita and possibly the hurdy-gurdy – whose folk orchestra, SonDeSeu brought an irresistible spectacle of vocal exuberance, rugged musicality and percussive artistry from the Celtic country that, we were assured, gets the best weather. The theme of the evening was tradition and the passing down of culture and folk wisdom from generation to generation with special emphasis on youthful participation. The young accordionist and pianist from North Uist, Phadruig Moireasdan’s opening film highlighted also the resourcefulness of his twentieth century forebears, with touching and humorous commentaries added to beautiful location shots and family photos as a quartet of singers and players sketched in a fine, apposite live soundtrack. At the heart of the Scottish element was an orchestra drawn from the Fèisean movement that has been so influential in developing young traditional musicians during – and before - Celtic Connections’ lifetime. Prominent alumni, Gaelic singer Julie Fowlis and fiddler Lauren MacColl were among those who joined them, the latter’s music from The Seer, which was commissioned by Fèis Rois, bringing both poignancy and swinging momentum. There were superb contributions also from piper Brighde Chaimbeul and the Orcadian youth music project Hadhirgaan, whose playing of the Heroes of Long Hope reminded us of the sacrifices made by lifeboat crews and their families. Then a reprise of Celtic Connections creative director Donald Shaw’s 2004 commission, Harvest saw its youngest participant, fiddler Graham MacKenzie, now a Royal Northern College of Music graduate, reintroduced before Highland band Daimh and the Galicians, minus their hurdy-gurdy corps, joined in for an international stramash of fiddle and pipes tunes, lusty singing and tambourine expertise. The Scots Fiddle Festival marked a new phase with a change of venue and its first commission in its twenty-three-year history. A celebration of fiddle music in all its styles, with often international guests added to its rich procession of home-grown talents, the festival was rewarded for this latest display of ambition with a sold-out opening night concert and a performance, courtesy of composer and multi-instrumentalist Mike Vass, which drew together fiddle history and a modern interpretation that honoured the instrument’s roots and even a ‘prop’ fiddle that was sacrificed in the name of justifiable drama. Vass’s The Four Pillars concentrated on the four main tune styles – air, march, strathspey and reel – and laced in vintage examples from School of Scottish Studies recordings of players who had inherited and carried the tradition forward with stories to match. A source of some mirth as well as of great character, these complemented the players onstage as they too carried the tradition forward through Vass’s intuitive tunesmithery and beautiful writing for the four soloists, string quartet, supporting keyboard and percussion and full ensemble alike. The evening had begun with youthful fiddler Ryan Young playing loudly acclaimed raw and direct tune sets to guitarist Jenn Butterworth’s accompaniment. Vass continued this spare approach in places - Lauren MacColl’s opening air was gorgeously soulful – while also integrating Iain Sandilands’ brilliant, live-wire vibraphone capabilities and imaginative pizzicato work from the string quartet. His own solo march, to Tom Gibbs’ keyboard accompaniment, was boldly stirring and Patsy Reid, on superb, snap-rich strathspeys, and Jenna Reid, playing reels with marvellous facility, interpreted his melodies with the strong personality and assurance they merited. BBC Radio 2 Folk Awards 2018’s Best Emerging Act’s second album arrives not so much like an avalanche as another meteorological phenomenon, a hurricane. Ímar, a quintet who met on Glasgow’s bustling traditional music scene and form an alliance of Scottish, Irish and Manx idioms, are certainly a force of nature. So much so that it might well be the third track, the relatively reflective White Strand before any of them actually draws breath. I say relatively reflective because there’s an energy, as well as superb cohesion between concertina, uilleann pipes, fiddle, frets and bodhran, here that makes even the album’s one slow air, an arrangement of the melody best known for carrying the hymn Be Thou My Vision, bristle with purpose and expression. Guest electric pianist Donald Shaw’s arrangements for string quartet add lush richness to the fast-lane zip of the opening Deep Blue, as well as other tracks, and there’s a marvellous moment when Mohsen Amini’s concertina appears to make a bid for freedom from the frontline charge of Revenge before the ensemble eases back into hurtling formation. File under fizzy. 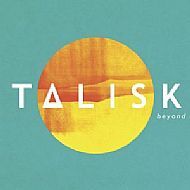 Multi-award-winning Glasgow-based instrumental folk/trad trio Talisk’s second album finds them stepping up the pace, if that was indeed possible, and increasing their sonic palette while also at times playing with gorgeous reflection. And although taking tradition-influenced adventure onto the next level – and the next – is their aim, there are passages of rugged fiddling especially that make it clear where this music originates. Essentially a concertina, fiddle and guitar team, with Graeme Armstrong here replacing original guitarist Craig Irving, they make a formidable sound as Mohsen Amini’s concertina produces hefty chords more in keeping with a cathedral organ and Hayley Keenan’s fiddle makes the broadest and boldest of bow strokes while both also negotiate the nimblest of riffs and motifs. Grit Orchestra conductor-arranger Greg Lawson adds violin and viola parts and Farewell, which begins with a simple guitar line before Keenan and Amini engage in springy collusion, ends with a massed choir of Scots trad pals wordlessly singing Armstrong’s opening theme. Big and powerful though the recorded sound gets, however, there’s probably little of this that the trio can’t reproduce in their passionate, exciting, high-energy gigs. What lies beyond Beyond will be interesting for sure. 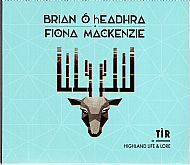 Highlands-based Brian O Headhra & Fiona Mackenzie have been working together for some twenty-five years, notably in the internationally recognised groups Anam and Cruinn, with whom they were nominated in the BBC Radio 2 Folk Awards in 2015 for Mackenzie’s stunning vocal performance on the track Manus Mo Ruin. This is their first recording since that near-brush with awards success and their first album as a duo, although the support and creative input from producer Mike Vass and his studio team might lead the casual listener to assume it’s a well-integrated band at work. The songs come from both ancient Gaelic texts and O Headhra and Mackenzie’s own writing and present a unified sound that draws on hundreds of years of tradition and yet sounds very much of our current times. 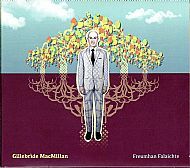 Mackenzie’s primeval, abandoned singing of the Latin psalm, Deus Auribus: Gleidh M’ Anama is right up there with Manus Mo Ruin in making the hairs rise on the back of the neck, and the duo pitch sweet expression and seasoned clarity together to great effect on the cheerier prayer, Beannaich, A Thriath Nam Flath Fial. It’s easy to understand how the Kinnaris Quintet became excited when they started making the sound that flows through the improvised intro to John Reischman’s bluegrass classic Saltspring. There’s an immediately appealing combination of tension and ease in the coming together of Fiona MacAskill, Laura Wilkie and Aileen Gobbi’s fiddles, Laura-Beth Salter’s mandolin and Jenn Butterworth’s guitar that, along with the players’ natural musical personalities, gives the group its own style. It’s a style pitched somewhere between the Scottish Highlands and the Appalachians, raw and yet sweetly accomplished, brawny and yet harmonically assured, and with occasional echoes of Steve Reich-like minimalism. Their first album in a relatively short but eventful history (they played first gig at the end of 2017) Free One opens with Nonna Pina’s lovely deep, atmospheric fiddle statements before hurtling off on the percussive, smartly punctuated Space Ghettos. As a whole it’s a confident showcase of the wonderful understanding between MacAskill, Wilkie and Gobbi as both the melodic spearhead and tender, unified accompanists and a great example of musicians moving the tradition forward while showing, on the retreat march Mary Binnie, sure appreciation of where it all begins. Gillebride MacMillan has reached a huge new audience through his portrayal of Gwyllyn the Bard in the television drama Outlander, a role that suits him particularly as, off-screen, he is a song-maker, as well as a Gaelic singer with a wonderfully rich, distinctive voice. The songs on this, his third album, in many cases have the sound of bardic works that might have been passed down through generations, and yet as a collection it is as contemporary as tonight’s news bulletins. Duan an fhògarraich and A chailinn donn are both inspired by the plight of refugees and Feum thu ràdh a-rithist? laments our inability to learn the lessons of war, although as with Tha d’ eanchainn àlainn, with its underlying theme of coming to terms with autism, the instrumental arrangements and fine production by Mhairi Hall bring an upbeat, even poppy mood. Fans of MacMillan’s traditional singing will find special satisfaction in Craibh an teaghlaigh and Eun beag where words and melodies luxuriate in his marvellously expressive delivery and there are splendid contributions from Fraser Fifield, on whistle and kaval, Anna-Wendy Stevenson (fiddle and viola) and singer Rosa Cedrón, who lights up Santiago’s Gaelic-Galician celebration. The ever-resourceful composer, multi-instrumentalist and seaman Mike Vass thrives on an unconventional approach to recording and this latest venture finds him in the company of musicians including accordionist Mairearad Green, fiddler-guitarist Anna Massie and harpist Corrina Hewat and various sounds volunteered by his boat. Despite everyone dropping in at different times, and in different weather conditions, there’s a warm, rich and woody consistency to these tracks, although Vass’s fellow Highlander Duncan Chisholm creates a highlight in Speeches through his fabulously characterful, indeed, majestic fiddle tone and measured playing. Fiddler Gillian Frame’s fine contribution includes spelling out the opening Last Day’s title in the International Radiotelephony Spelling Alphabet, a sound that establishes the waterborne nature of the recording. Other, unscripted sounds include Vass’s then nine-month-old niece’s recording debut in a vocal loop while her mum condenses her keyboard talent onto melodica. Imar whistle player, Tomas Callister’s designated reel, Inver, has a hefty, emphatic, maritime thud behind its swinging momentum and the album closes with a superb, upbeat and powerful jig featuring Innes Watson on fiddle and guitar. There’s no flag-waving involved, other than perhaps the nautical variety, just high quality, honest musicianship and great tunes. As they’ve shown on two visits to Celtic Connections and on their YouTube hit (at least it was on my computer), A Room in Paris, Scandinavian trio Dreamers' Circus are the masters of sustained collective momentum. This latest album, their third but the first to be released here, has some of that uptempo magic but is more of an understated masterpiece. Between them, Swede Ale Carr and Danes Rune Tonsgaard Sorensen and Nikolaj Busk play a music shopful of instruments, including cittern, violin, accordion, piano, harmonium and the zither-like kokle, and they draw on their native folk traditions to create music that is haunting, gently mysterious, gorgeously atmospheric and always superbly considered. The opening City Gardens paints a vivid scene by stealth, with Sorensen’s violin initially cutting a lonely figure before the others’ cittern and accordion arrive with the lightest of touches, and the collectively written Rooftop Sessions Part l and ll are almost symphonic with a simple melody corkscrewing off into the distance. Busk’s Then We Waltzed lives up to its name and Carr’s Mormor dances charmingly between Nordic and oriental leanings before Afterwards’ keening reflection has the listener’s index finger hovering over “replay”. From The Herald, August 18, 2018. It was a little disorientating to see the Celtic Connections backdrop in August as Glasgow’s world-renowned winter festival brought two of its favourite bands to Edinburgh International Festival’s Light on the Shore series. Once the music began, however, we might have been standing in the Old Fruitmarket or Barrowland rather than Leith’s long-neglected town hall, as it was known when it hosted rock concerts back in the 1970s. Both Le Vent du Nord and Julie Fowlis have created international successes from singing in minority languages, the former robustly so. Fowlis has taken Scottish Gaelic to a broader audience with an easy-on-the-ear style and accompaniments driven by crisp guitar and bouzouki rhythms and featuring Patsy Reid’s viola alongside Duncan Chisholm’s beautifully nuanced fiddle playing. Gaelic touchstones including her early influence, Runrig, here represented by the English language song The Old Boys, and singer Gillebrìde MacMillan, who introduced Fowlis to the Galician song Camariñas and now better known as the bard in Outlander, were referenced in a set that also included Fowlis’ Gaelic reading of Paul McCartney’s Blackbird alongside more traditional Gaelic topics such as seal folk and water horses. In contrast to Fowlis’ carefully manicured music, Le Vent du Nord came on like the north wind of their name. Once a more gentle breeze, theirs is a turbo-charged, physically involving sound, now more than ever reminiscent of their Quebecois predecessors, the marvellous La Bottine Souriante. Like La Bottine they’re fuelled by foot percussion, here supplied by two fiddlers taking turns at this piston-like role, and specialise in call and response songs, sung lustily. Foundation-shaking bass guitar gives them a rock band’s dynamic which introduces unlikely prospects such as a hurdy gurdy player with his foot up on the monitor, heavy metal guitarist style, although the songs and music remain staunchly ‘from the tradition’ with superb accordion and fiddle lines and – you won’t read this phrase too often – rock-the-house jew’s harp playing. If the Celtic Connections backdrop was disorientating, the resulting party unfolding on a Monday night was indeed a sight to behold. Trains and the lines they follow have inspired composers, poets and artists the world over virtually since the first tracks were laid. 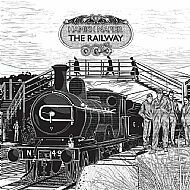 The Railway that multi-instrumentalist Hamish Napier is concerned with here, however, is the one closest to his home, the Speyside line, and through music, a couple of songs from his brother Finlay and the distillation of railway workers’ recollections he has captured the scenery, stories, facts and characters involved in its heritage. It’s a handsome package with a booklet containing photos, lyrics, interviews, background information on the line itself and insight into the inspiration behind the tunes. These variously dance through some of Scotland’s finest scenery, convey personal romances and as diesel trains replace steam engines, roar along with Ross Ainslie’s pipes setting a fearsome, exhilarating pace. With an instrumental cast also including guitarist Ewan Robertson, multi-string player and arranger Patsy Reid, bassist James Lindsay and drummer-percussionist Fraser Stone, Napier carries off this commission from Karen Blessington (the Grantown East: Highland Heritage & Cultural Centre’s guiding spirit) with skill, creating contrasts between sweeping grandeur, maverick engineers, the deadly intervention of Dr Beeching and the jauntiness of a family day out. 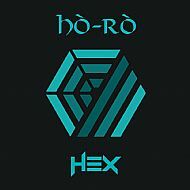 Hex is the second album from the group from the Scottish Highlands & Islands who won the Up and Coming Artist of the Year title at the MG Alba Scots Trad Music Awards last year. Two years on from their first release, Hex features an expanded, six-piece line-up with Highland pipes, Border pipes, accordion, fiddle and whistles buoyed by a crisp rhythm section that confidently draws on rock, pop, funk and Caribbean grooves to create a powerful sound. Instrumentally Hò-rò pack an assurance and high level of skill that seems to come as standard with young Scottish bands these days, with accordionist Calum MacPhail showing particular skill and excitement in his phrasing as tune sets such as Elliot Finn grow from pub session intimacy to stadium rock-like anthemic grandeur and intensity. If the songs – two each in Gaelic and English – and singing aren’t quite so well developed, they still carry a certain charm and Lucy Doogan’s delivery of a song, Muinntir mo Ghráidh, which was discovered in her late grandmother’s attic, is a lovely, honestly sung addition. 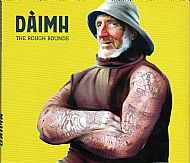 Named for the West Lochaber area where they played their first gig twenty years ago last month, The Rough Bounds finds Daimh in rude good health. Currently a six-piece, with recent arrival, Lewis-born fiddler Alasdair White joining the three remaining original members, Angus Mackenzie (pipes), Gabe McVarish (fiddle) and Ross Martin (guitar), singer Ellen MacDonald and accordionist-mandola player Murdo Cameron, they present a sound here that’s instrumentally rich and sensitive to the needs of the Gaelic songs at the heart of their music. A humorous key gives a visual guide to the songs’ content, with much heartbreak, some homesickness and the occasional punch-up, and MacDonald’s fine singing is supported on two tracks by illustrious backing vocalists including Kathleen MacInnes and Calum Alex MacMillan. The group is confidently and thrillingly self-sufficient, however, as the pipes and fiddles intro to strathspey and reels set Mary’s Fancy illustrates with the sheer physicality and rhythmical strength of the musicianship. Elsewhere, there’s a train-like sound to the fiddles on the Donald MacLeod Reels that’s superseded by a locomotive-like momentum on whistles and pipes, and a contrastingly restrained quality to the majestic closing air, Chi mi’n Toman. 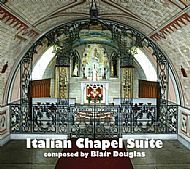 Inspired by the chapel created by Italian prisoners of war that has become Orkney’s most visited tourist attraction, this suite marks a departure in some senses for the Skye-based composer, accordionist, keyboards player, Blair Douglas. Its form and instrumentation, featuring largely harp, violin, viola, cello and flute, might be different from some of Douglas’ other work, which won him the Scots Trad Music Awards Composer of the Year title in 2008, but the actual notes are yet another example of his ability to capture places and people with soulful feeling. There are also tunes here that will surely be picked up by other performers, including the waltz for the man responsible for most of the chapel’s interior decoration, the lovely Lamb Holm Addio and both the march played by the City of Kirkwall Pipe Band and the solo pipe tune that closes the piece. That Douglas is affected by the prisoners’ personal stories as much as their efforts is clear but equally impressive is his command of material, including a choral hymn, in bringing it all together with a unity of purpose in a handsome package designed by his wife, Marion. Fiddle and guitar partnerships don’t get much more mutually responsive than the Northumberland-Edinburgh axis of Stewart Hardy and Frank McLaughlin. Both players draw on a range of techniques and a great variety of touch and attack to deliver their shared passion for a good melody, more often than not with a story attached. There’s a lovely richness of expression in Hardy’s fiddling and he uses this to superb effect whether the tune is essentially joyful, wild or written in sadness. On Something for Gordon, for example, he plays Ross Ainslie and Jarlath Henderson’s tribute to the great piper and tunesmith Gordon Duncan with a respectfulness of someone who has really got into the thoughts of the composers. He can be cheeky, too, though and he and McLaughlin take the Scottish-born fiddle master of Gateshead, James Hill’s Factory Smoke into the swinging realms of Minnie the Moocher before delivering Hill’s XYZ in more typical, robust, rollicking style. Day for Giggles features joined at the hip flat-picked guitar and nimble fiddle assurance on a twisting melody and elsewhere McLaughlin’s sympathetic finger-picking and hammering on underlines their commitment to fashioning arrangements as equals. Great stuff. Ross Ainslie and Ali Hutton’s second album takes them further into the territory that their mentor, the late, great piping adventurer Gordon Duncan, encouraged them to explore. As their teacher and pipe major in the forward-looking Vale of Atholl Pipe Band Duncan was keen for Ainslie and Hutton, as teenagers, to incorporate the pipes into arrangements that used whatever instruments came to hand. Now, some twenty years on and given their own mastery of pipes, whistles, cittern, banjo and various guitars alongside supporting synths, electronic beats, percussion and a string section, they are creating music that uses traditional tunesmithery as the basis for ever more sophisticated music that has grandeur without being over grandiose and introduces exotic textures in an entirely natural way. Some tracks, such as Donegal fiddler Tommy Peoples’ slow air Beautiful Goretree, use spare accompaniments to create atmosphere and strength through simplicity while others, such as the aptly named Action or the later Mink, showcase the superb fluency of their playing before building in intensity and colour. 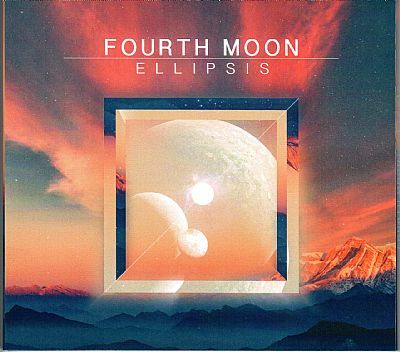 It’s an album that’s full of ambition as well as musicality and repays repeated listening by revealing further shades and detail with every play. 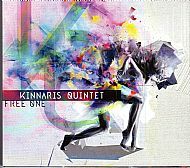 Nic Gareiss introduced the concept of international quartet This Is How We Fly by saying that the dancer becomes part of the melody and the musicians become part of the dance. He might also have added that all four group members paint with sound and create poetry with word and deed. Michigan-born Gareiss is the dancer and his relationship with fiddler Caoimhín Ó Raghallaigh, here playing the ten-string hardanger d'amore, clarinettist Sean Mac Erlaine and Swedish percussionist Petter Berndalen is probably interesting enough when viewed from the auditorium. With the audience seated in the round onstage with the group, this was an experience beyond fascinating. Part of the attraction is the lightness of touch each of the quartet applies in making traditional tunes and dances – and some more abstract sounds and scenes – come alive. Gareiss makes music with the slightest brush of his heel on his dance board and creates rhythm just by rubbing a dance shoe on a trouser leg. His description of the moves involved in an Acadian dance became a kind of mesmerising rap, only exceeded in its mesmerisation by his carrying out of the steps. If Ó Raghallaigh and Mac Erlaine are the ones who, as well as gentling along the bare bones of a traditional tune, take the music into spontaneously creative zones, then Berndalen is the source of madcap humour while also making brilliantly subtle melodic-rhythmical shapes with one drum stick and the fingertips of his left hand. Their encore found Mac Erlaine introducing Mongolian throat singing as a drone for the other three’s quiet as a whisper melody and rhythm making, a stunning coda in keeping with the whole performance. Winner of the Musician of the Year title at the recent BBC Radio 2 Folk Awards and former BBC Radio Scotland Young Musician of the Year, concertina player Mohsen Amini joins three fellow young players in Glasgow-based Fourth Moon. As with other groups Amini has featured with, such as the admirable Talisk and Imar, energy and vitality, as well as strong musical capabilities, are the watch words here. Even at their most reflective the fiddle of David Lombardi, Geza Frank’s flute and whistle, Jean Damei’s guitar and Amini’s concertina sing with a life force that’s just busting to break into full-on celebration. The tunes on these ten sets are strong and the arrangements are geared towards making the most of these melodies, with thought to texture, tone and tempo that can call to mind a chamber music group in terms of sound quality and tonal range. The opening Glasgow Roaster sets the pace with lots of flavour in the execution of a fizzing pair of tunes and the nimble Olympus and Celestial’s swashbuckling unison attack are stand-outs but only comparatively as the overall quality of the album is consistent and repays repeated listening. From The Herald, April 21, 2018. There’s always been a natural joyfulness in the sound the String Sisters make together. Right from their first performance at Celtic Connections in 2001 there was something in the blend of Shetland, Scandinavian, Donegal and Irish-American accents that communicated a sense of harmony and well-being. And so it continues on an album that has its moments of reflection and lost love but assumes joie de vivre almost as its default position. All six fiddlers contribute tunes, from the Irish-bluegrass feel of ‘The Crow’s Visit’ and the crisp, pizzicato atmosphere of ‘Open to the Elements’ and from the medieval quality of ‘Trotto’ to ‘Late Night in Førde’s’ train-like cry and locomotion. Doubtless there will have been much imagination, thought and rehearsal behind it all but with the measured and always apposite accompaniment of the String Misters rhythm section, the ensemble sounds so relaxed and easy, even at its most orchestral. Mairéad Ní Mhaonaigh and Emma Härdelin give winsome voice in a duet of murder ballad ‘Wind and Rain’ and each has a solo song that adds to the overall personality of an album that cheerfully demands repeated listening. Three of the folk and traditional music scene’s busiest and most visible musicians, guitarist-singer John Doyle and multi-instrumentalists John McCusker and Mike McGoldrick tour and make music together for fun away from their often hectic work schedules, and that’s largely the thinking behind this, their first studio album as a trio. A collection of ten tracks equally divided into songs and instrumental sets, The Wishing Tree doesn’t go out of its way to draw attention to itself, although it takes a lifetime of playing to sound as effortless as these guys. 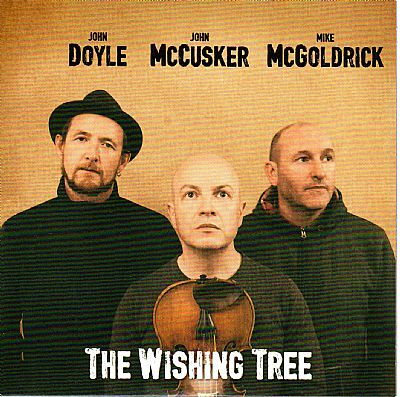 The arrangements of jigs, reels and airs are thoughtfully simple, showcasing McGoldrick’s flute here, his tight partnership with McCusker’s fiddle there and profiting from the effectiveness of Doyle’s guitar playing in providing both melodic momentum and rhythmical grain. Doyle’s quiet singing of the lamenting Bonny Light Horseman contrasts with the rousing shanty-style, chorusing of Billy O’Shea and his storytelling skills really come to the fore as he details the exploits of body snatchers Burke & Hare, an original song on which he conveys the dankness and darkness of Edinburgh’s old town closes and lands with a strong sense of realism. From The Herald, March 31, 2018. 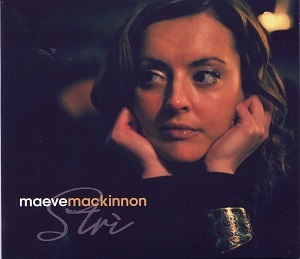 One of two Gaelic singers who share the same name, this Maeve Mackinnon is the Glasgow-born one who is steadily establishing herself as a singer of real character with a liking for surrounding herself with arrangements that reflect current times and sounds while keeping a firm connection to the tradition. Stri means to strive or struggle and many of the songs here are drawn from the waulking songs sung by hardy Highland and Island women during long shifts at the tweed tables. Mackinnon delivers them with a quiet force that’s darkly expressive while producer Duncan Lyall’s arrangements for strings and electronica, supplemented by superb uilleann piping from Jarlath Henderson and whistle playing from Ali Hutton in a band sensitively driven by drummer Alyn Cosker, lend atmosphere and groove. The one song sung in English, We’re Not Staying features former Chilean president Salvador Allende’s final broadcast setting the scene for a defiant chorus that chimes with the work songs from this side of the world, giving a sense of unity before Mackinnon’s gorgeous interpretation of Mo Cheist Am Fear Bàn, with Patsy Reid’s soul-stirring fiddle, ends the album on a note of utter, very affecting bereftness. From The Herald, March 17, 2018. 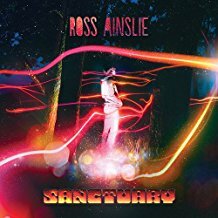 There’s craftiness as well as musical craft involved in Ross Ainslie’s third album. The multi-instrumentalist, whose duos with Ali Hutton and Jarlath Henderson and work with Treacherous Orchestra, among others, have brought a raft of awards, has taken a similar approach to Sanctuary as Mike Oldfield did to Tubular Bells. It’s designed to be listened to in one sitting and for anyone tempted not to conform, just as you think, this might be a suitable point for a break, up comes another change of pace or direction, and another, and so on to the final piece which, as with Oldfield’s magnum opus, features the spoken word. Although exotic guests, tablas master Zakir Hussain and sarod player Soumik Datta, are involved, they don’t arrive until later. So the opening track might have you wondering who the Indian violinist is. It is, in fact, Greg Lawson who, like Ainslie’s other accomplices, moves easily between Asian, possibly Macedonian and definitely Scottish forms. Hussain’s fabulous, ringing clatter lights up Happy Place but Ainslie’s headlong pipes flight on Road to Recovery and glorious whistle glissandi on Obstacles of the Mind ensure he’s the boss of this admirably rockin’, flowing platter. 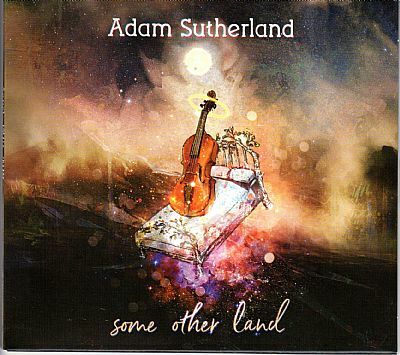 Fiddler Adam Sutherland not only composes in his sleep, as the cover art for this, his second album suggests. He also writes tunes in his own image. The gallus, cheeky Dusk on Loch Ness that brings the album to a celebratory conclusion has Sutherland’s name running through it like seaside rock has “Blackpool” and there’s a similarly personal quality about the opening track, The Wizard, where following a band introduction, Sutherland is left alone and exposed as if playing the melody in a bothy or maybe just in his bedroom having woken up with the notes forming in his head. Sutherland won the Composer of the Year title at the 2017 MG Alba Scots Trad Music Awards and Some Other Land celebrates his love of melody. It also demonstrates his ability to develop ideas and to work with empathetic musicians in realising them in a variety of ways. Somhairle Dubh dances on a rhythmical bed that a prog rock band might covet. The Broken Man and the Banker has some Memphis soul in its grooving DNA and The Lada has cousins in the Balkans, although ultimately the dominant accent is Sutherland’s own very strong Scottish one. From The Herald, February 17, 2018. From The Herald, February 7, 2018. Follow that, as they say. One man, the late Martyn Bennett, created Bothy Culture, an album that gathered together Scottish and Islamic elements in a natural and celebratory musical alliance. So when his friend Greg Lawson reimagines Bennett’s music for his bespoke, nearly 100-strong Grit Orchestra, comprising traditional, classic and jazz musicians, the effect can be like standing in the actual landscape famously captured by a master in oils. If this was the case when Lawson presented Grit, Bennett’s final masterpiece, at Celtic Connections in 2015, then it was even more so here as a model of the Cuillin formed the backdrop to the orchestra and their guest aerial ballet corps and stunt cyclist Danny MacAskill. Actually, bike ballet might serve as a better description of MacAskill’s contribution as he matched his hit YouTube film by arriving in a rowing boat and performing somersaults, onstage mountain climbing and graceful front and back wheel dare-devilry. At the heart of the pageant was the music, however, a glorious procession of bagpipe glissandi, parping brass, addictive fiddle figures, heavy duty cello riffs, gongs dipped in buckets of water, and brushes stroking the sounds of waves from snare drums. Lawson, who transcribed the album, has an ear for meticulous detail and his orchestrations brilliantly capture the sighing violin chords of quiet, soulful reflection as well as the intense emotional swell of Bennett’s powerful, dance-driven forward motion. David Hayman’s reading of Sorley MacLean’s Hallaig brought gravitas and further craggy atmosphere and there was humour, too, as Innes Watson, forsaking his normal guitar and fiddle, gave Bennett-like voice to the one-sided phone call on Aye and led the communal diddle on Yer Man from Athlone. A huge audience in a huge arena underlined the sense of occasion and nobody would have objected to the album running order going off-script with the arrival of Fiona Hunter to sing Blackbird from Grit, the magnificent soundtrack to MacAskill’s entrance and a reminder that beyond Bothy Culture lay even more magic from Bennett in a career that was cruelly cut short. Celtic Connections director Donald Shaw has achieved two long-standing ambitions relating to Gaelic song at this year’s festival. At the beginning of the week, at Shaw’s suggestion, the South Uist-born singer Kathleen MacInnes joined saxophonist Tommy Smith and pianist Brian Kellock in a spontaneously arranged and conspicuously successful, if brief, merging of Gaelic tradition with jazz harmonies and improvisation. MacInnes’s gorgeous voice, with its suggestions of peat smoke and a malty tang, featured again in this extensive celebration of the Gaelic song repertoire in the equally unusual company of the BBC Scottish Symphony Orchestra, augmented for the occasion by traditional instruments including the uilleann pipes and a keening fiddle. The fear might have been that these songs, some dating back centuries, others much more recent, would be smothered with saccharine arrangements or overpowered by orchestration but a light touch and a shrewd awareness of form and singer dispelled such thoughts. The strong tones of Robert Robertson, currently gaining attention with the young band Tide Lines, and the superb Gillebride MacMillan, now better known as the bard in popular TV series Outlander, were allowed to smoulder on tales of longing while Karen Matheson’s sure-footed waulking song that told of female bards in a fatal war of words was buoyed and driven with empathic orchestral momentum. Despite the concert hall setting there was no standing on ceremony. Indeed, a feeling of informality, engendered by television presenter Kirsteen MacDonald’s mischievously informative introductions and one or two mistimed arrivals, added to the evening’s success. Even when Isobel Ann Martin, a Royal National Mod Traditional Gold Medallist, was overcome by the occasion the audience response was understanding, warm and heartfelt. At the end all the singers, including the multi-award-winning Julie Fowlis, the rapidly maturing Mischa MacPherson, the apparently unaffected by time Mackenzie Sisters from Lewis and the tireless Gaelic advocate Arthur Cormack, gathered onstage for a spirited rendition of the popular waulking song Hèman Dubh before orchestra and audience were commandeered into a community choir for the work song turned anthem Sìne Bhàn. It was, as Frankie Gavin pointed out, the trio’s first gig together. Quite a coup for Celtic Connections, given uilleann piper Paddy Keenan, fiddler Gavin and accordionist Dermot Byrne’s status in the Irish music firmament. And it might have been their last. Well, not really, Keenan’s return to the dressing room in a mock huff when Gavin told him he would recognise, but not know [how to play] the first tune of the encore was followed by a typically blistering trio finale. The offending tune hardly fitted into the ‘old Irish tunes that are now neglected’ script the trio follows, being a choro, Tico Tico, but Gavin and Byrne played it with brio and I wouldn’t bet against Keenan having learned it by now and being able to add the outrageous ornamentations that come as standard when he plays. Both he and Gavin, known respectively for their time with the Bothy Band and De Dannan, are notorious speed merchants, and there were elements of ‘who’s following whom’ as reels flew, yet the contours of the melodies are always honoured. When, with Byrne adding brilliant feints and harmonies, they hit the golden seam on, appropriately, The Yellow Tinker, they were beyond exhilarating. For contrast, Keenan added The Snows They Melt the Soonest on low whistle and while he might not have remembered its full name, he gave this lovely air his full expressive attention. Earlier, Gaelic-Indian quintet Lahira found fruitful common ground between two traditions, with Anne Martin singing clearly and emotionally and her musicians creating superb tension and release, especially on a heightened violin, tablas and beatboxing exchange. Twenty-five years ago, almost to the night, a troupe of Irish-American musicians and step-dancers arrived on the Glasgow Royal Concert Hall stage as unknowns and departed with a reputation that would make Cherish the Ladies one of Glasgow’s favourite bands and Celtic Connections regulars. Not too much has changed since that first visit. The musicians, playing reels with classy assurance, now come as much from this side of the Atlantic. Their leader, Bronx-born whistle maestra Joanie Madden, however, remains ebullience personified and although the dance element was reduced to a single male it was jaw-droppingly virtuosic. Cherish the Ladies’ runaway local success has become emblematic of Celtic Connections itself, or at least one facet of the festival. An event that’s grown into one of the world’s greatest roots music gatherings, it began as something to light up the dark January nights – and fill a venue’s empty schedule - and quickly became a party where friendships were formed onstage and off and musicians were encouraged to become as ambitious as the festival. The scale and content of this opening night extravaganza underlined that ambition. Bands that were formed specifically to appear at Celtic Connections, such as the transatlantic fiddle convention String Sisters, returned as international touring acts, in this case highlighting their Nordic tendencies with the superbly orchestrated carousal, Late Night in Førde. By contrast, elsewhere, Celtic Connections’ more sobering engagement with global events was illustrated by the cast of the World War 1 commemoration Far, Far From Ypres saluting the terrible numbers of fallen in that conflict and by the more recent, personal reflections of Syrian Maya Youssef, articulated through the percussively singing strings of her zither-like qanun and her newly-forged partnership with Emma Härdelin and Mairéad Ní Mhaonaigh’s lovely voices. An evening that began with the Highland pipes playing a Gaelic air honoured those traditions with two further highlights, the piping ensemble Tryst with their magnificent harmonies and young Hebridean singing group Sian, who showed the promise to be headliners when Celtic Connections’ next significant anniversary rolls around.